The last two articles discussed the popular ‘sandwich technique‘ for giving interpersonal feedback. The first article introduced the sandwich feedback technique. The second article critiqued this method and discussed three common mistakes that render the sandwich technique ineffective. This follow-up article will introduce an effective feedback technique and list links for further information. This article focuses on manager-to-employee feedback. However this feedback model can be the foundation for giving feedback in other interpersonal contexts as well—between peers or between spouses, for instance. Manager Tools is a widely-admired suite of management techniques to help shape effective managers and leaders. The weekly podcasts on this site feature Manager Tools’ principals, Mark Horstman and Mike Auzenne, discussing their tools and tips to help audiences advance their managerial and leadership skills. The discussion forums are useful as well. Perhaps the most popular and most effective of the Manager Tools ideas is the effective feedback model. Here is a summary of the four steps in this feedback technique. Here are links to podcasts and references for further information on the Manager Tools effective feedback model. Effective feedback model: podcast on the four-step technique and the corresponding summary sheet. Podcast on tailoring feedback to distinct employee communication styles. Podcast on adapting the feedback model for giving feedback to peers. A list of podcasts for advancing managerial and leadership’s skills. Feedback is a central component of the manager-employee relationship. Employees get better at their jobs only when their managers give them timely, relevant and forthright feedback — both affirmative and corrective feedback. Use the Manager Tools feedback model to enhance your feedback skills and communicate effectively with employees. Wondering what to read next? 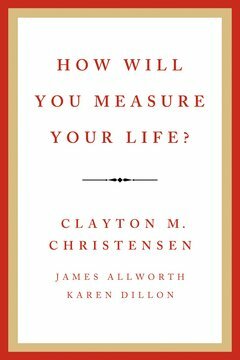 Harvard business strategy professor Clayton Christensen's exceptional book of inspiration and wisdom for achieving a purpose-filled, fulfilling life. Here’s a prayer to help you deal with annoying people. Learn from the Stoics!